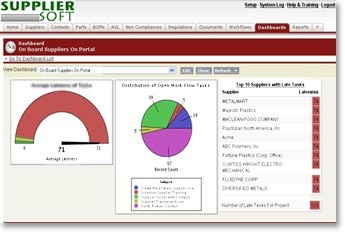 Supplier self-service with expiration driven reminders: Through a supplier portal, suppliers maintain their own information, freeing up supply chain professionals to manage strategic aspects of relationship. Expiration driven reminders ensure that that information stays up-to-date. Configurable supplier profile: Besides standard supplier profile information such as address, DUNS and tax information, information specific to your business can be easily defined. Supplier profile can be configured to identify industry-specific capabilities and information such as financials, supplier certifications, EHS, supplier surveys and audit findings. Configurable surveys without supplier login: You can define a configurable survey to track any supplier information. A configurable scoring mechanism enables you to score suppliers based upon their responses. You can mass e-mail the survey to suppliers with a link in an e-mail. Suppliers click on the link and provide you the information without logging into the system, reducing the need for supplier training. The system automatically tracks which suppliers have responded and provides comprehensive scoring and reporting capability on the collected data.See Survey Features for more information. Integration with third-party sources: Supplier profile can be validated and complemented with data from third party sources such as D&B. Contact management: Suppliers maintain their own contact information. Contact information is validated frequently through expiration driven reminders. The system automatically identifies bounced e-mails. The solution also enables definition of business role-specific contacts such as environmental compliance, quality and financial contacts. Certification management: Through self-service, suppliers provide certification data such as quality, insurance, environmental, diversity and occupational safety. Expiration driven updates ensures that certifications stays accurate. Supplier contracts and NDAs: Supplier contracts and NDAs are stored centrally in one location with visibility across the organization. Expiration driven updates ensures that these critical documents are kept up-to date. Integrated project management: Supplier facing projects that involve tens or hundreds of suppliers (such as a risk assessment initiative) can be managed. Project dashboards provide project managers with real-time visibility into project status. Risk based supplier audits: This add-on module is fully integrated and enables definition and management of any audit such as quality, EHS or financial audits. The system supports supplier self-audits, audits by your auditors and third party audits, enabling three way collaboration. Integrated corrective action management: This add-on module is fully integrated and enables companies to drive corrective and preventive actions to timely closure, resulting in reduced supplier risk.